It seams consumer mortgage was just one piece of the cycle, and the news is getting worse every day. And the approach to fixing it (leaving consumers up to their eyes in debt while bailing out the banks) fails to account for the positive feedback loop from falling consumer demand. We are already bailing out mortgage (Fannie Mae & Freddie Mac), insurance (AIG), the banks, autos, and now the cancer is spreading…where government funds are being asked for by hedge funds and commercial real estate developers. With a record amount of commercial real-estate debt coming due, some of the country’s biggest property developers have become the latest to go hat-in-hand to the government for assistance. They’re warning policymakers that thousands of office complexes, hotels, shopping centers and other commercial buildings are headed into defaults, foreclosures and bankruptcies. The reason: according to research firm Foresight Analytics LCC, $530 billion of commercial mortgages will be coming due for refinancing in the next three years — with about $160 billion maturing in the next year. Credit, meanwhile, is practically nonexistent and cash flows from commercial property are siphoning off. Look for more violent swings in SRS. I wonder how far along talks are, and how this news will influence the market. “The catfish industry is on the verge of collapse,” said Marty Fuller of the Catfish Farmers of America, citing high feed prices and an increase of imports. About 6,000 jobs are at stake, mostly in economically depressed areas in states such as Arkansas, Mississippi, Alabama and Louisiana. Officials are talking about seeking $50 million in aid as a stimulus. As Barry Ritholtz said, “Capitalism without failure is like religion without sin.” How many industries can the US government bailout before the dollar collapses? Looking at all the bailouts makes me want to go on vacation, rather than earning a lot of money so it can be confiscated by taxes and handed to crooks. I can’t wait to read Bailout Nation! Great timing on the book, though I imagine there will be a need for an update in another year or two. Credit Card Issuers Unite to Force Consumers Into Bankruptcy? The NYT published an article about the credit card industry, highlighting steep cuts some lenders are makings. One of the more surprising aspects of the article was that shoppers were being profiled against other shoppers for credit cuts. So the lenders offer you a credit line that gives you a false sense of security, and pull the rug out from underneath you when you need to rely on that offer. Then they don’t even let you know until you have reached your new lower limit or a month has passed. Pricing risk behaviorally further increases the risks to the poorest of the poor. Lets say a person gets laid off or has a bad earning month and shop at Aldi (a discount grocery store). Based on risk assessments associated with shopping habits, acting responsible and living more frugally may increase the chances of a consumer getting their credit line pulled and going bankrupt. Snce the consumer bankruptcy law was rewritten by MBNA in 2005, consumers can’t get bailed out the way the bankers just did. If the consumer dies then so does the economy. But nobody cares about the consumer, and the consumers won’t realize it until they are a day late and a dollar short. Or was it it’s my money, and they want it now? The U.S. Treasury Department is considering taking equity stakes in insurance companies, a sign of how the government’s $700 billion program has become a potential piggybank for a range of troubled industries. The availability of government cash is drawing requests from all corners, with insurance firms, auto makers, state governments and transit agencies lobbying for a piece of Treasury’s pie. While Treasury intended for the program to apply broadly, the growing requests could rapidly deplete the $700 billion, an amount that initially stunned many as being quite large. The Treasury Department has decided to let banks individually announce that the government will invest in each firm, scrapping an earlier plan to release the names of multiple banks receiving federal money all at once. The decision came after concerns that banks left off any group list would appear too weak for government assistance, spooking investors and depositors and potentially making troubled banks’ situations more dire. With enough handouts appearance becomes reality. Spread that across dozens of industries and people will make a lot of false assumptions, killing many good businesses in favor of larger and sloppier competitors. 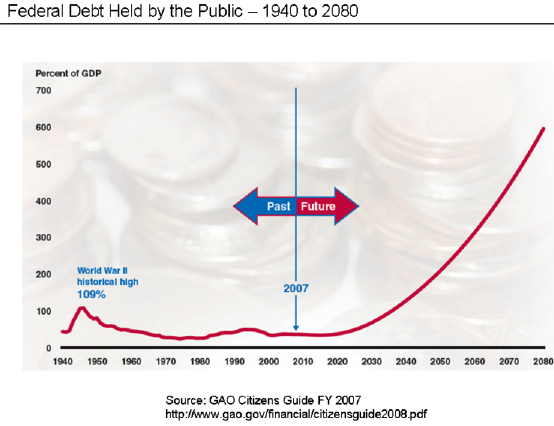 The United States already has a debt nearing $10 Trillion, much greater if you include unfunded liabilities like Medicare and Social Security. Richard W. Fisher, President of the Dallas Federal Reserve pegs the number closer to $100 trillion. Mr. Fisher ended his speech with this quote about weakness of the US Dollar. Of late, we have heard many complaints about the weakness of the dollar against the euro and other currencies. It was recently argued in the op-ed pages of the Financial Times that one reason for the demise of the British pound was the need to liquidate England’s international reserves to pay off the costs of the Great Wars. In the end, the pound, it was essentially argued, was sunk by the kaiser’s army and Hitler’s bombs. Right now, we—you and I—are launching fiscal bombs against ourselves. You have it in your power as the electors of our fiscal authorities to prevent this destruction. Please do so. That speech has fallen on deaf ears. U.S. Treasury secretary Henry Paulson pushed through a banking industry bailout plan which grants the Treasury authority to issue up to $700 billion of Treasury securities to finance the purchase of troubled residential and commercial mortgage-related assets, which may include whole loans and mortgage-backed securities. The Seretary may work with the Fed to purchase any other assets they deem necessary to stabilize the financial markets. Worse yet, the Treasury’s actions may not be reviewed – by any administrative agency or court of law. Unelected quasi-governmental officials have a limitless credit card to buy junk at whatever price they see fit, and nobody can review or overturn their purchases. What does the future look like? Pretty ugly. This chart was made before the above bailout and limitless credit card came to be.